From the infamously musical City of Los Angeles, BUTCHER BABIES is a band that really hold a fair bit of weight in their name, for nearly a decade now they have been a relentless touring force; and have cemented their reputation with ferocious live performances. They have shared a stage with the likes of MEGADETH, ROB ZOMBIE, MARYLIN MANSON, and CRADLE OF FILTH; their current album, “Lilith” has arrived just in time for Halloween, and is released through the good people at Century Media Records. I must admit that I have never actually heard any material from BUTCHER BABIES; I have read articles about them, seen people wearing their T-shirts, heard their name come up in conversations about bands; but never heard a single note they play. I was immediately excited when I found out I was getting to review their new album. The opening track, “Burn The Straw Man”, whispers to the listener with a soft rattle, the thick guitar riff builds the momentum to the almost groaning vocals; then the song opens up like muzzle flash in the dark. The drums really boom in this track, the beat and rhythm to this song is full and really catchy. The dual female vocalists clearly give this band that special something else, this point really gets emphasized in the title track “Lilith”. The slow and kind of spoken word opening has almost a taunting mockery in its tone, then you are struck with the full fury of raspy growls; this builds to a big soaring chorus, were the higher pitch female voice really dances. Track number three, titled “Headspin”, is another impressive arrow in the musical quiver displayed here. A more mid paced track overall, but has no less of a furious presence; the changes in the song structure flow so well and it has the catchiest chorus I’ve heard yet. As a matter of fact, every song had a little something that the one before didn’t; whether it is a brutally catchy vocal line, a well-placed guitar groove, or a double bass blast; at no point did this album becoming boring or repetitive. Other stand out tracks were “#iwokeuplikethis”, “Oceana”, and amazing vocal melodies in, “Look What We’ve Done”. “Lilith” was produced by Steve Evetts (SUICIDE SILENCE, DILLINGER ESCAPE PLAN), so the sound has a real maturity to its sound; and every instrument is tweaked to perfection. 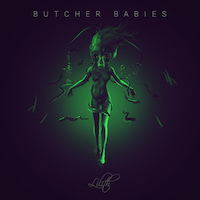 I think that the members of BUTCHER BABIES can really hold their heads up high; this is a truly exemplary collective of musical pieces; top marks right across the board, I cannot recommend this enough.